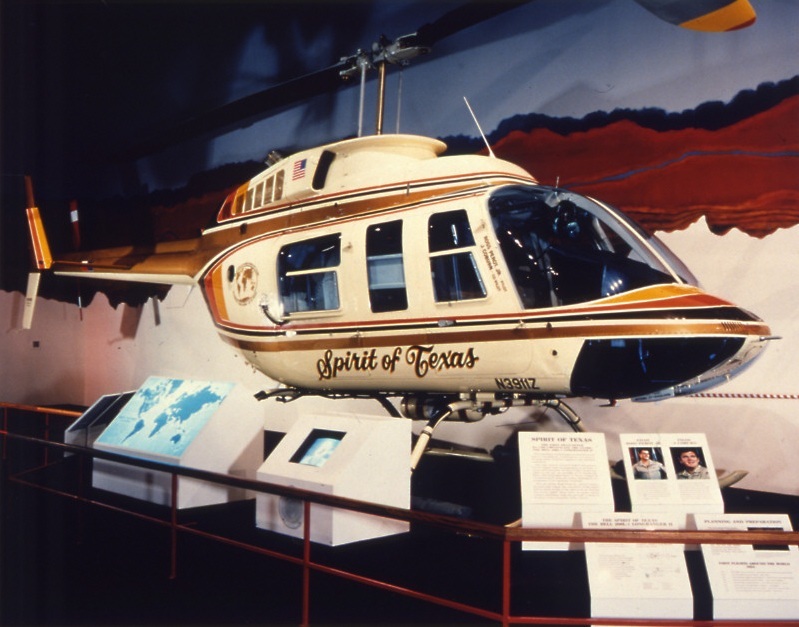 30 September 1982: H. Ross Perot, Jr. and Jay W. Coburn completed their around-the-world helicopter flight when they landed Spirit of Texas at their starting point at Dallas, Texas. 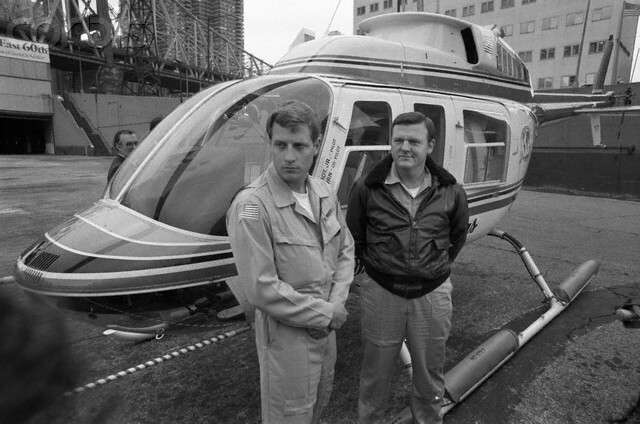 They had flown the single-engine Bell 206L-1 LongRanger II, serial number 45658, civil registration N3911Z, more than 26,000 miles (41,843 kilometers) in 246.5 flight hours over 29 days, 3 hours and 8 minutes. They had begun their journey 1 September 1982. Perot and Coburn traveled across twenty-six countries. They established a Fédération Aéronautique Internationale (FAI) record for helicopter speed around the world, eastbound, having averaged 56.97 kilometers per hour (35.399 miles per hour). (Class E-1d, FAI Record File Number 1254). They also established a series of point-to-point records while enroute, with the highest speed, an average of 179.39 kilometers per hour (111.47 miles per hour), taking place on 7 September 1982, while flying Spirit of Texas from London to Marseilles (FAI Record File Number 10018). The Bell Helicopter Company Model 206L-1 LongRanger II is a 7-place light helicopter developed from the earlier 5-place Model 206B JetRanger series. It is designed to be flown by a single pilot in the right front seat, and is certified for Visual Flight Rules. The 206L-1 is 42 feet, 8 inches (13.005 meters) long, overall, and the two-bladed main rotor is semi-rigid and under-slung, a common feature of Bell’s main rotor design. It has a diameter of 37 feet (11.278 meters) and turns counter-clockwise (seen from above) at 394 r.p.m. (100% NR). (The advancing blade is on the helicopter’s right side.) The rotor blade has a chord of 1 foot, 1.0 inches (0.330 meter) and 11° negative twist. The blade tips are swept. The two-bladed tail rotor assembly is also semi-rigid and is positioned on the left side of the tail boom in a pusher configuration. It turns clockwise, as seen from the helicopter’s left. (The advancing blade is below the axis of rotation.) The tail rotor diameter is 5 feet, 6.0 inches (1.676 meters). The LongRanger II is powered by an Allison 250-C28B turboshaft engine. This engine produces 500 shaft horsepower but is de-rated to 435 horsepower, the limit of the main transmission. The engine is mounted above the roof of the fuselage, to the rear of the main transmission. Output shafts lead forward to the transmission and the tail rotor drive shaft aft to the tail rotor 90° gear box. The transmission and rotor mast are mounted angled slightly forward and to the right. This assists in the helicopter’s lift off to a hover, helps to offset its translating tendency, and keeps the passenger cabin in a near-level attitude during cruise flight. A vertical fin is attached at the aft end of the tail boom. The fin is offset 4° to the right to unload the tail rotor in cruise flight. Fixed horizontal stabilizers with an inverted asymmetric airfoil are attached to the tail boom. In cruise flight, these provide a downward force that keeps the passenger cabin in a near-level attitude. Vertical fins are attached to the outboard ends of the horizontal stabilizers and above the tailboom centerline. The fins are slightly offset to the left and counteract the helicopter’s Dutch roll tendency. The helicopter has an empty weight of approximately 2,160 pounds (979 kilograms), depending on installed equipment, and the maximum gross weight is 4,050 pounds (1,836 kilograms). The Model 206L LongRanger first flew in 1974 and the 206L-1 LongRanger II variant entered production in 1978. It was replaced several years later by the 206L-3. The LongRanger remains in production as the Model 206L-4. 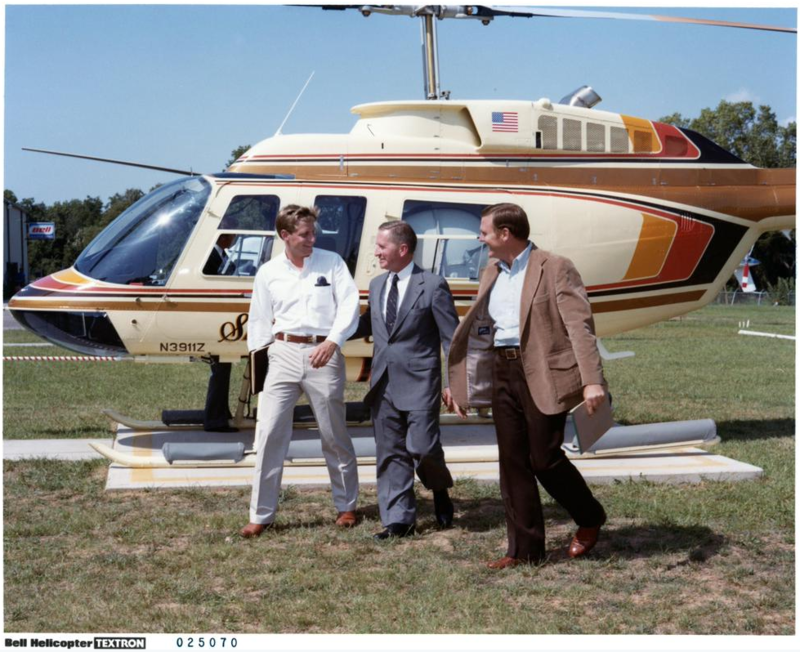 Perot had purchased the LongRanger II for $750,000, specifically for this flight. Modifications started immediately and over the next three weeks an additional 151-gallon fuel tank was added giving the helicopter approximately 8 hours’ endurance. “Pop-out floats”—inflatable pontoons that can be deployed for emergency landings on water—were installed. The helicopter also carried a life raft and other emergency equipment and supplies. Additional communication, navigation equipment and radar was installed. N3911Z aboard a container ship. 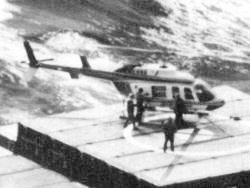 During the circumnavigation, the helicopter burned 56,000 pounds (25,400 kilograms) of jet fuel and made 56 fueling stops, including aboard a pre-positioned container ship in the North Pacific Ocean. The helicopter was donated to the Smithsonian Institution and is on display at the Steven V. Udvar-Hazy Center of the National Air and Space Museum. Launched out of Kadena in an HC-130 on a rescue mission for Perot on a portion of his around the world flight. This was the landing on the container ship leg, and it was not cleared with the Rescue Coordination Centers at Elmendorf and Kadena. We made it up to Yokota before anyone knew his status as he continued into China.